Home purchases one of the biggest investments you will probably ever make so knowing all you can ahead of time and being aware of the process can save you time, energy, and money. We know the Louisville real estate market and can help first-time buyers and current homeowners find the right home, in the right neighborhood, at the right price. 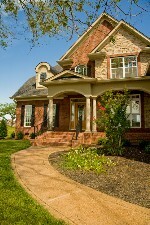 Here are some simple steps to buying a home in Louisville Kentucky. If you're financing a home you want to get preapproved with the lender first. Unless you have the cash to purchase a home out right you will need to discuss financing and obtain a home loan from a lender, mortgage broker, or bank. You'll need to supply them with all of your finances including W-2s, tax returns, income, assets and liabilities. They will determine the right price range that fits your budget comfortably. Once completed they will issue you a letter of preapproval. This is highly valuable to present to sellers when submitting an offer as it shows you Vardy done your financial homework and can comfortably purchase the home you're offering on. Start looking at homes. Start your online search here for Louisville real estate for any of the surrounding areas including Oldham County and Jefferson County, Henry County and Bullitt County. We provide all the current listings for all of these areas in addition to new construction, homes on the golf courses around our area, foreclosures, waterfront properties, and short sales. You'll want to find a buyer’s agent that you like and trust to showcase all of the homes for you personally. This is a smarter way to buy resident going to the listing agent of a buyer’s agent has your interest and your budget at heart rather than just trying to sell a particular home. Once you find a home you love you want to submit an offer, wait for approval, submit the earnest money deposit, hire a professional home inspector for a thorough inspection, and finalize any financing before closing on the property.